Item 74090, Clerk File 220366 (Record Series 1802-01), Seattle Municipal Archives. 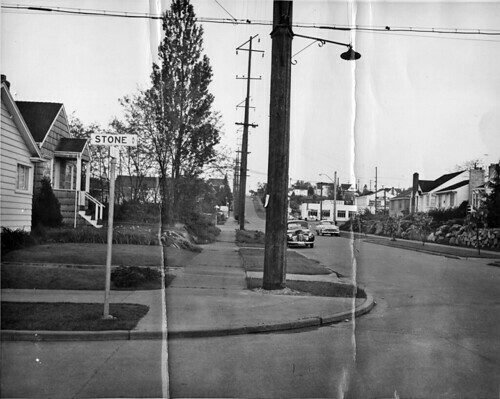 The item description says: "Stone Ave. and N. 62nd. 5 a.m. [CF 220366 Petition of Dr. J.D. Robuck for rezoning of Lots 3, 4 and 5, Block 2, Bonen’s Addition (corner of N. 82nd & N. Green Lake Way).]" Is the 62 a typo? I can’t tell from the picture, as the angle of the sign is too acute, but the intersection of 62nd & Stone Ave doesn’t currently exist, whereas 82nd & Stone Ave does exist, and it’s a block away from 82nd & Green Lake Way, which is given as the address of the addition being petitioned for rezoning. Should the item description be changed to read "Stone Ave and N 82nd", and the title for this picture be changed to "North Green Lake neighborhood"? I believe you’re correct, Severinus – thanks for the catch!